Multi-function printers have become an essential part of professional as well as personal lives and they are also known as all-in-ones or popularly known as AIO which provides the customers with a huge variety of features and functionalities beyond printing. They can also copy and scan and many business MFP can also add faxing feature. Our favorite range of these MFPs includes smaller models which are best suited for home as well as office use and cost nearly $100 in comparison with big ones in order to meet the requirements of a busy work group with good duty cycles of thousands of pages per month. 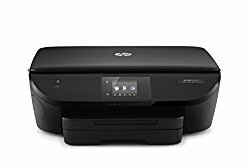 If you are looking for an MFP for office use or any best all in one printer, then you will care more about text rather than photos which essentially means that you will definitely want a laser or laser-class printer which includes LED as well as solid-ink printers. You may also want the ability to fax, email and also includes an automatic document feeder in order to scan, copy, fax as well as email multiple page documents. In case you require a printer for the dual purpose of home as well as office, you will require an inkjet for its inherent photo quality but also equipped with office-centric features such as automatic document feeder and fax modem. In order to select a good MFP for office and home use, it is better to make a list of functions and features that you will require. It includes basic features such as printing, scanning, and copying. However, these features are not enough. Some MFPs are limited to scanning the documents over a USB connection. In case you wish to connect your printer to a network, make sure that it’s scanning features works on a network too. The inherent capabilities of a printer to scan transparencies such as slides and strips is usual enough which is often considered to be a separate function. So it is better to make sure the sizes of MFP that can handle these transparencies which are often limited to 35mm. In some cases, these MFPs require a computer for copying. But in case you wish to copy when the computer is off, make sure that the MFP is also able to work as a standalone copier. A fax feature is also considered to have standalone faxing which can be controlled through the keypad of the MFP. It doesn’t require to include a PC Fax function that is faxing documents directly from the PC without having the requirement to print them first. PC Fax can be a great form of fax utility, a fax driver that allows you to use a print driver too. When it comes to MFP or best all in one printer, email features often come in two forms. There is a direct-email function which allows you to scan and then send an email directly to your internet service provider or even an in-house email server which is present on your network. The most common choice of lower class MFP is to open an email on a PC and then add the scanned document in form of an attachment. Any MFP can provide both kinds of email. Some direct-email features may not work with all internet service provider so make sure that you buy the MFP which works with yours. Most of the MFPs generally include flatbeds which are best suited for scanning photos as well as single-sheet documents. There is an automatic document feeder or an ADF which allows you to easily scan as well as copy, fax, and email multiple page documents. For MFPs with letter-size flatbeds, an ADF will provide you the ability to scan legal-size pages. So better check this functionality before buying the MFP. Some ADFs can also perform scanning both sides of a page which is called the duplex function. In case you have to deal with various two-sided documents, then this feature can be worth having. In case of most MFPs, they support duplex scanning which performs so by scanning the one side of the document then turn the page over and then scan the other side. Some provide one-pass scanning which scans the both sides all at once, which is a faster way to do so. Best all in one printer comes with this great feature. In case you don’t have any requirement of printing anything in color then you shouldn’t waste money on this features. However, there are many laser MFPs that can print high-quality marketing materials to be printed. This can be quite less expensive than printing a small number of marketing material at a local print shop. Most of the MFPs which are best all in one printer are quite bigger in size when compared to single-function printers. They can be tall enough to make you feel that they are towering your desk if you put them there. So make sure that the size, as well as weight of the MFP, is according to your convenience even though there are fewer chances that you will be moving it a lot. Along with the option of USB port, most of the MFP comes with Ethernet and/or Wi-Fi connections which enables them for easy sharing. In case you need a Wi-Fi one then make sure that you have a wireless access point present in your network so that you can print the pages wirelessly to any MFP that is present on that network. It is in spite of the fact that whether MFP provides Wi-Fi or not. Some MFPs also comes with Wi-Fi Direct which allows them to connect to compatible devices without any requirement of wireless access point. There is new technology of Near-Field Communication, often called as NFC, which allows you to start printing with your compatible devices by simply tapping on the printer with your mobile phone or tablet. Along with the print output quality, you must need to check the scan quality of the document. However, it is not a major issue for office since almost all scanners can scan the documents with a satisfactorily level of high quality scanned documents. But when it comes to photos, you should take a closer look especially when there is an issue of transparencies. Any Best all in one printer provides good output quality. Whenever you are checking the duty cycle as well as input capacity of the MFP, make sure that it can add copies as well as incoming faxes to the total number of pages that it can print. Mentioned below are the top 10 best all-in-one pritners. This is an best all in one printer which is a perfect choice owing to its low running costs and when it comes to enormous amount of supply of ink supply, it provides that which allows the average user up to two years of printing based on the figure that he prints a volume of 300 pages at 70% black and 30% color. The operating costs are quite less than 1 cent per black and white page and as low as 5 cents for one color page each. It comes with great features for the office which includes two-sided printing or duplex along with wireless printing from various devices such as AirPrint, Google CloudPrint, Brother iPrint7Scan as well as Mopria and Wi-Fi Direct. Its networking is enabled via Wi-FI along with Ethernet and Wi-Fi direct. You can also print directly from the USB too. It has a paper capacity of 100 pages and it can handle a legal sized paper of dimension (8.5” x 14“). You are also provided with the capacity to print up to 12 black and white pages or 10 color pages per minute. It is an awesome printer for small offices which has multiple printing options. It is an all-in-one inject printer present by HP which boasts about its great connectivity options along with borderless photo printing. It is an ideal option for those looking for standard tasks along with copying, faxing as well as photography. You are allowed to manage printing jobs through a 4.3-inch color touch screen which comes with an intuitive tap along with swipe features. It also provides wireless printing which is facilitated by AirPrint for Apple devices along with NFC touch-to-print when it comes to other smart devices. However, some users have complained about facing difficulty when they tried to set up wireless functionality but once it is done then it works seamlessly and bring convenience to your life by bringing documents with great quality. It comes with phenomenal print management options which have high speeds along with ultra-fast automatic duplex or two-sided printing. It also has a 50-page automatic document printer along with 250-sheet paper tray. It can print up to 24 black and white pages per minute and when it comes to color pages, it can print up to 20 pages. Its high volume trays along with efficient model result bring down the cost per page when compared to laser printers. It provides documents scan at 1200 dpi resolution along with borderless photo print in a standard size of 4 x 6-inch. There are only a few under $100 printers in the world at present which can make it very hard for you to choose. That’s why we recommend HP Envy 5642 e-All-in-One is best all in one printer because it comes with all the main features such as print, copy as well as scan. It can also print better photos when compared with equally priced AIOs. It does have a low-volume. It is an entry-level printer with a paper input drawer of mere 125 sheets. It has small ink cartridges. However, there is a larger black cartridge which is good for printing 600 prints which is also too small. It is the best option for printer when it comes to having requirement of low print volume. It is a wonderful AIO high-volume printer and has been around for quite some time and it costs at less than $200. It has excellent print quality, almost near to laser quality text. It comes with NFC touch-to-print with compatible devices and also has Wi-Fi Direct support to for network-free printing. Like any other available these days, you can easily make prints from your smart devices such as iPhone, iPads and Android devices. It comes with 330 sheet paper capacity which is split between 250-sheet main drawer along with an 80-sheet multi-purpose tray. It can easily do two-sided printing along with copying, scanning as well as faxing. It also has 35-page automatic document feeder for all the above-mentioned features such as copying, scanning and even faxing two-sided multi-page documents. It comes with an intuitive touchscreen control panel which increases the ease of use and it prints at 20 pages per minute when it comes to black and white prints while it has 7.3 pages per minute for color pages. It is a four-color inkjet printer which has a maximum resolution of 4800 x 2400 dpi which provides hi-resolution business documents. With its high-yield cartridges, it offers great cost per page. It is one of the best all in one printer which is wireless and provides great photo quality printing. You can easily print, copy, scan and eve n fax from its compact AIO along with the automatic document feeder which is capable of holding up to 30 pages. It provides two-sided printing and the print speed is at 9.5 pages per minute for black and white pages while for color pages it is 9 pages per minute. It is a slow printer but color printers are generally not fast. It also has an additional capability to print on pre-surfaced optical discs which is a great feature. It is great printer who doesn’t have heavy usage demand and wants to have an all-in-one printer which has great print quality. It comes with mobile printing options such as printing directly from devices such as phone or tablet as it has Epson Connect software along with other mobile printing options. It comes with a 4.3-inch touchscreen which increases the ease of use. It is a mono-laser multi-function all-in-one printer which is best suited for personal use and even for the home office. It provides great text output quality and comes with awesome features. 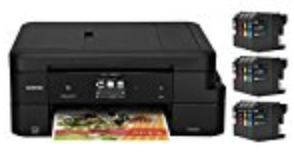 It has Wi-Fi Direct which allows it to connect to mobile devices without the requirement of a router and you can easily print as well as scan on-the-go with Canon Print as well as Apple AirPrint. Mopria and Google Cloud Print. You are also provided with the ability to use USB Direct to print and scan using a USB connected device. Its Secure Print provides the privacy of your printed documents and also allows you to set up password protection for up to 300 users. It is rated at a speed of 35 pages per minute with first print at mere 6.3 seconds. It comes with a 3.5 inch intuitive LCD display which makes menu navigation quite simple. You can easily load this printer with up to 250 pages and it comes with 50-sheet auto-duplexing ADP when it comes to scanning. It also has 50-sheet multi-purpose tray along with an optional 500-sheet paper cassette. It is quite a remarkable and affordable among best all in one printer which is worth mentioning. It provides 8 pages per minute for black and white pages while for color pages it provides 4 pages per minute. This is quite slow. It comes with My Image Garden software. However, this software is not that intuitive but it allows you to print from any software along with apps available on Apple Store as well as Google’s Play Store. It has 4800 x 600 dpi maximum resolution which renders a clear and great image and comes with advanced features such as auto power-on through wireless support for Google Clout Print. One ink cartridge will last about 300 pages. It is a good option if you plan to use it occasionally as this printer uses a huge amount of ink the price associated with the replacement ink is quite high. This printer comes with fast printing speed at 28 pages per minute and provides good quality output. It also has great connectivity options and it is one of the most versatile printers available in the market. Its size and weight are quite adjustable making it a space-saving machine which is compacted enough that it can be easily carried by one person. It can comfortably be put alongside a computer in the home office. I can handle requirements of the most users as it has the front-loading 250-sheet paper cassette. It comes with 35-sheet automatic document feeder along with one-sheet multipurpose tray. The connectivity options are great. It provides USB, Wi-Fi and Wi-Fi Direct which provides you the ability to print on-the-go owing to its compatibility with Apple AirPrint, Google Cloud Print, Mopria Print Service. It can also scan hard coping using the app from Canon, the Canon Print Business app. It is among the best all in one printer with exceptional print speed along with great print quality and competitive cost per page. It is quite wide and comes with 50-sheet override tray which folds down. It folds from the left side of the chassis. It provides scanning, copying and other PC-free tasks along with initial configuration which allows you to perform through a 4.3-inch graphical touch screen. This interface has an entire control panel and it allows to change the contexts to adjust according to the task at hand. It also provides scanning and printing from a USB thumb drive. It has standard fare of support from various cloud sites along with printing from email and Apple AirPrint. You are also provided with two most recent peer-to-peer connectivity protocols, namely, Wireless Direct and NFC. Wireless Direct allows the printer to connect to the mobile device without any requirement of the router while the NFC allows touch-to-connect protocol. It is a also another of the best all in one printer with a 20-page count for letter-size originals. However, it is quite low for legal size documents of size 8.5×14 inch and dwindles down to five sheets. It doesn’t have auto-duplexing scanner. It comes with wired as well as wireless connectivity which consists of Wi-Fi networking as well as connecting directly to the PC using the USB. 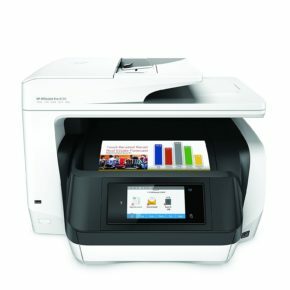 It also has a mobile connection via Apple AirPrint, Google Cloud Print, Mopria and Canon Print along with Pixma Cloud apps. It also has Wireless PictBridge for printing from few Canon digital camera. However, it doesn’t have Wi-FI Direct or NFC. It is quick to install and you can connect it to PC via USB. You can connect it with wireless too. However, it doesn’t come with Ethernet. The setup does take time with seven-minute initialization and takes up to 20 minutes. It has great print quality and cost per page is its best feature. The replacement ink is quite affordable. Its tray can hold up to 20 sheet of premium photo paper due to its location as well as ease of use. The removing of existing papers as well as reconfiguring is quite simple. Multi-function printers are used daily in homes and offices and with their inherent great features, it has made them an important part of the daily tasks. Any one of these best all in one printer, can copy, scan, print and fax documents. It provides great color quality pages. The cost per page is quite low for most of the printers discussed above. The average pages per minute rate are also good. Many printers come with various connectivity features. They can be connected using USB, Wi-Fi, Wi-Fi Direct and NFC. It also provides various options of automatic document feeder which makes it comfortable for the user to use the printers. Most of them have good output quality and the capacity size is also good. These printers are cost-effective solutions with some of them are perfect for small and medium-sized businesses. Some of them are good for personal use. So, if you are looking for the good all-in-one printer then have a look at this list and judge for yourself and select the one which suits your requirement. With this, we complete our review of top 10 all-in-one printers. Let us know about your views and comments in the section below.